W. W. Norton & Company, 9780393329803, 206pp. The first practical and accessible guide to the art of punctuation for creative writers. Punctuation reveals the writer: haphazard commas, for example, reveal haphazard thinking; clear, lucid breaks reveal clear, lucid thinking. Punctuation can be used to teach the writer how to think and how to write. 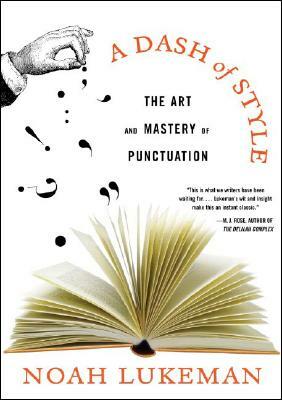 This short, practical book shows authors the benefits that can be reaped from mastering punctuation: the art of style, sentence length, meaning, and economy of words. There are full-length chapters devoted to the period, the comma, the semicolon, the colon, quotation marks, the dash and parentheses, the paragraph and section break, and a cumulative chapter on integrating them all into "The Symphony of Punctuation." Filled with exercises and examples from literary masters (Why did Poe and Melville rely on the semicolon? Why did Hemingway embrace the period? ), A Dash of Style is interactive, highly engaging, and a necessity for creative writers as well as for anyone looking to make punctuation their friend instead of their mysterious foe.